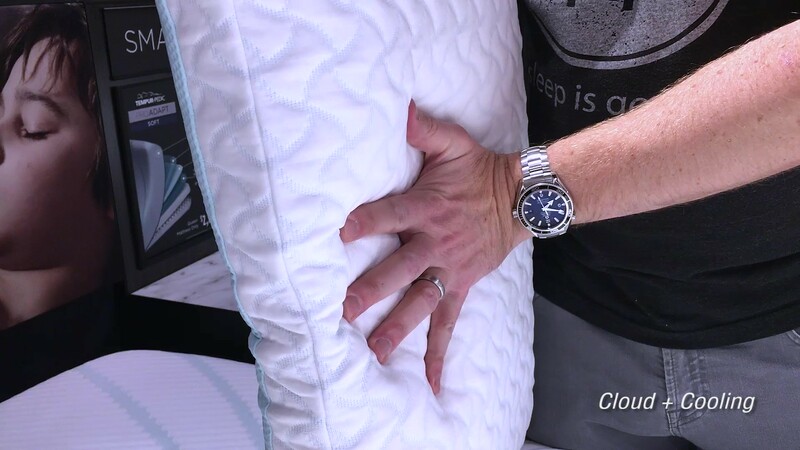 This is GoodBed's look at four Tempur-Pedic pillows with cooling covers. Note: This is not a review. This is our plain-English explanation and overview of the Tempur-Adapt Cloud + Cooling and the Tempur-Adapt Pro + Cooling series of three pillows. 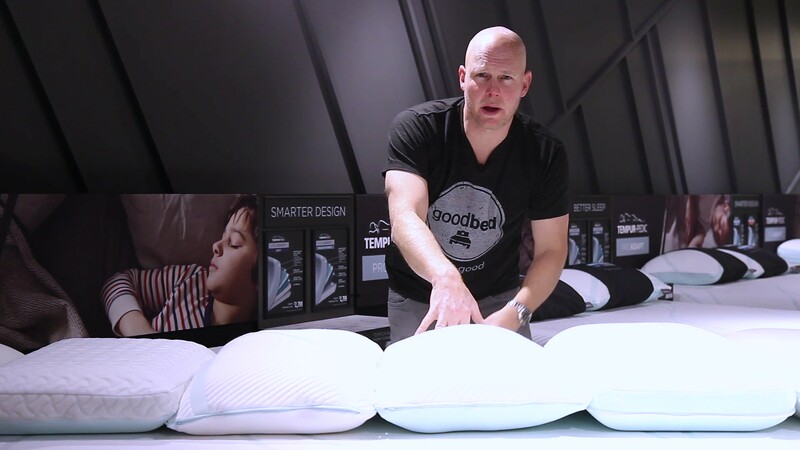 If you’d prefer to watch rather than read, check out our Tempur-Adapt Cooling Pillows video. Tempur-Adapt Cloud + Cooling Medium $99 / NA 5"
Tempur-Adapt Pro + Cooling Lo Extra Soft $149 / $189 6"
Tempur-Adapt Pro + Cooling Mid Soft $149 / $189 6.5"
Tempur-Adapt Pro + Cooling Hi Medium $149 / $189 6.5"
New for 2018 are four pillows from Tempur-Pedic with new cooling fabric covers. The same fabric is also used on the covers of the Tempur-Adapt and Tempur-ProAdapt mattresses, for which we also have an overview. Choosing the right pillow for your needs depends on your body type and weight, your mattress and its cushioning, and your sleep position. Here's our guide on how to choose the right pillow type for your needs. The use of cooling materials is a new-ish trend in bedding. Typically, we see "phase change" materials included as a coating on a mattress's cover that makes it feel cool to the touch. Tempur-Pedic takes a different approach with the new covers on its Tempur-Adapt cooling pillows. Woven into the fabric are special high-density fibers that by their very nature feel cool to the touch. (Think about how a high density material like marble feels cooler than low-density material like wood.). Since the fiber is woven in, it can't wash off or diminish over time. And in our time with the pillows they felt noticeably cool to the touch. Note that the cooling material is only used on one side of each of these pillows; the opposite side uses a non-cooling fabric. This is the least expensive pillow that includes Tempur-Pedic's cooling cover. It also has the lowest profile of the four pillows. For our tester, laying on the Tempur-Adapt mattress, this pillow was a good fit for back sleeping. The Clould + Cooling is a very rectangular shaped pillow without doming (where the center of the pillow is puffed up), owning to its construction, a single piece of Tempur-Pedic's memory foam material. It definitely has a slow-responding memory-foam feel. Note that with all of these new cooling pillows, the cooling fabric is just on one side, meaning that there is a "top" and a "bottom" for all of these pillows. The Cloud + Cooling pillow comes in one size, 24" x 16" x 5" and is classed as a Medium pillow by Tempur-Pedic. We found it quite soft. 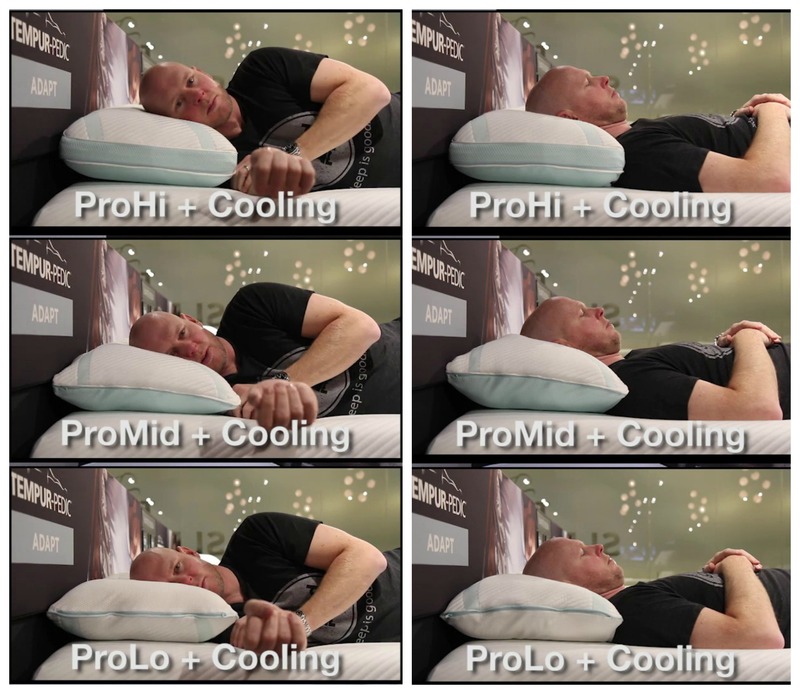 The more expensive Pro + Cooling pillows come in a series of three. Each has a different thickness, firmness and loft, which you can see in the composite image below in both back and side-sleeping positions. All three include Tempur-Pedic's new cooling fabric on one side only. The Pro + Cooling pillows come in two sizes, queen and king. The queen pillows are 25.5" wide, while the king versions are 33.5" in width. As you might guess from the names, the Pro + Cooling Lo is the shortest/narrowest of the three, and it's made of three layers of comfort material, including Tempur-pedic's memory material. We found this to be a soft and squishy pillow, and at least for our tester laying on the Tempur-Adapt mattress, it worked well for him in back and side-sleeping positions to create a neutral spinal position. The Pro + Cooling Mid pillow is progressively firmer, and has more doming on the top (where the top of the pillow puffs out more). This pillow also has three layers of comfort material, including a thicker layer of memory material. The Pro + Cooling Hi pillow is even more firm (which you can really see illustrated below). It's made of a single piece of memory material. When it comes to choosing between these pillows, the goal of any pillow is to fill in the gap between your head and the mattress; which you choose will depend on your sleeping position, bed and its cushioning, and your body shape/weight. As with choosing a mattress, there's no "right" or "wrong." Rather, it's a matter of assessing your needs and preferences, then choosing an appropriate pillow. Not sure where to start? Check out our guide to choosing a pillow. Tempur-Pedic pillows are available in many stores, whose delivery and return policies will vary. For orders placed online directly through Tempur-Pedic, delivery is free. Note that because pillows are a personal item, Tempur-Pedic does not allow returns. Tempur-Pedic pillows carry a 5 year warranty against manufacturing defects.